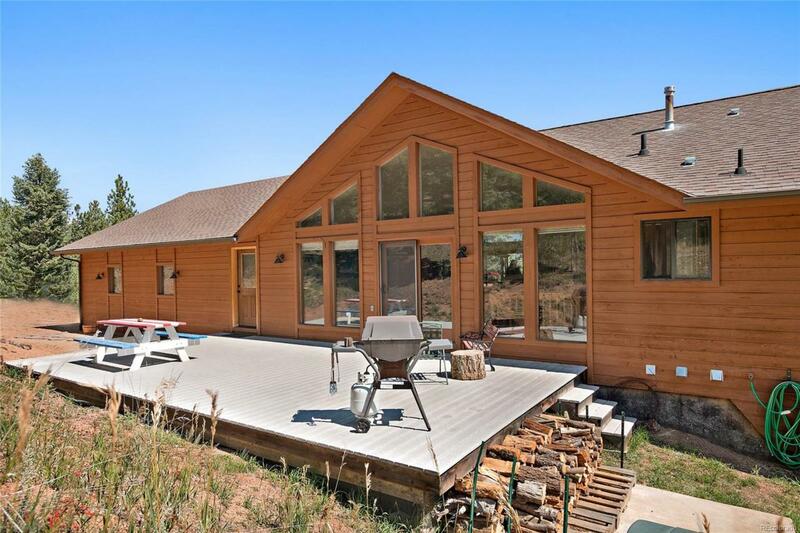 This lovely mountain home offers a peaceful and relaxing setting with quick and easy access to 285. Inside is a spacious, bright great room with floor to ceiling windows, hardwood floors and a cozy wood burning stove. The open floor plan design includes a roomy kitchen with tons of cabinet space, a breakfast bar and a dining room. And, you can enjoy main level living with the master suite, two bedrooms and a full bath all located on the ground floor. Downstairs youll find plenty of space to stretch out in the fabulously finished walk-out basement, complete with a huge family room, a non-conforming 4th bedroom or den and a full bath. This home also features a central vacuum, mud room, newer carpet and an oversized 3 car garage. Outside is perfect for entertaining on the huge, composite deck or just relaxing by the firepit on a chilly night. The large level parking pad offers plenty of parking space and the usable lot is fully fenced and private with frequent visits from wildlife.